This guide will show you how to create a report with data on one of your business partners. Jaspersoft Studio is a free, open source, Eclipse-based report designer. You can download it from here. Make sure that you have one of the newer versions. Note: When signing up for a free account, is recommended to select the “No, thanks” link contained in the account registration dialog. The download will then commence. Report Designer is a plugin for Jaspersoft Studio which allows you to design reports for Coresystems solution. Start Jaspersoft Studio, then select Help > Install New Software. Click Add... in the top-right corner. 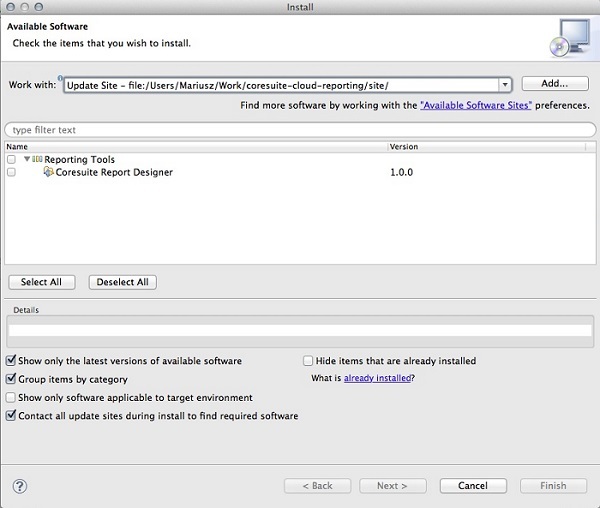 In the Available Software dialog, select the checkbox next to Coresystems Report Designer and click Next. If Jaspersoft is started without admin rights, the Uninstall field will be greyed out. This field is activated when started with admin rights. Data Adapter defines the data source. 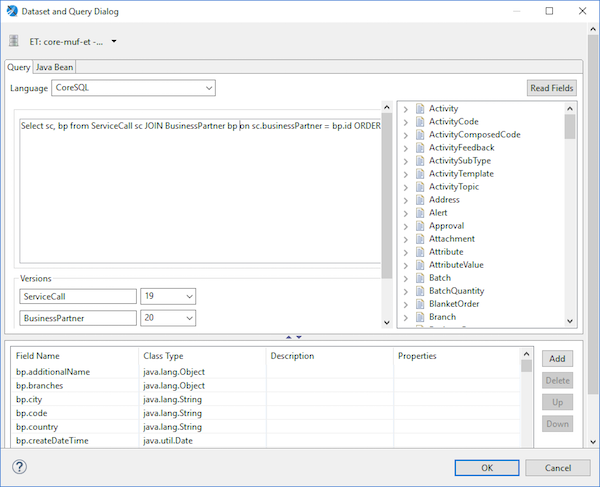 The Query API or can be used to return relevant company data. 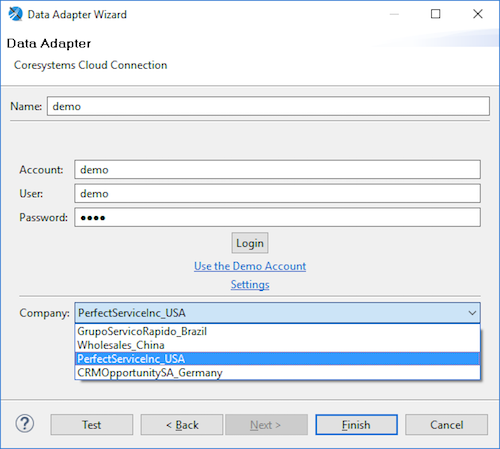 Create a new data adapter of type Coresystems Cloud Connection. You are free to use any name you like. Enter your Coresystems account credentials and click Login. Choose your company. You can also select the demo account. Click Test to make sure that your connection is working. A Jasper project is a container for your report. It includes designs, style files, translations and images. A Jasper report is a design. Create a new one inside your project, using the blank template. The main report must be named report.jrxml as this is the starting point. You can create zero or more subreports. Open the Dataset and Query Dialog dialog (the icon in the top right corner of the Design view). Select your data adapter and CoreSQL as the query language. This query will return a business partner with the some id. The dtos parameter specifies the version of the transfer object. For more details please refer to the Query API documentation. Report field represents a way to map data from data source into the report. You can define a field yourself, or click the Read Fields button to retrieve possible fields. You can find all possible fields and suitable data types for every object type in the Query API documentation. Add a new field businessPartner.name of the type java.lang.String. You can add more fields if you like. Once you’re done, go to the Design window, drag and drop the field from Outline view to Detail band. For every business partner, in our case just one, a detail band instance will be inserted into your report. 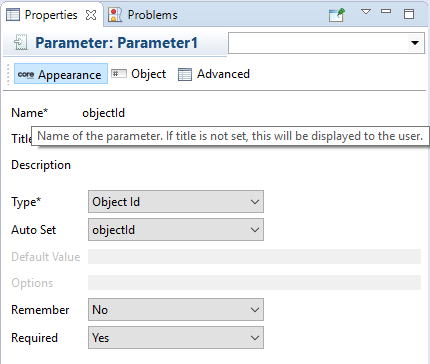 Report parameter represents some data which is used in the report, but is not present in the data source. Add a new parameter businessPartner.id of type java.lang.String. Add a custom property on it with the name autoSet with the value objectId. 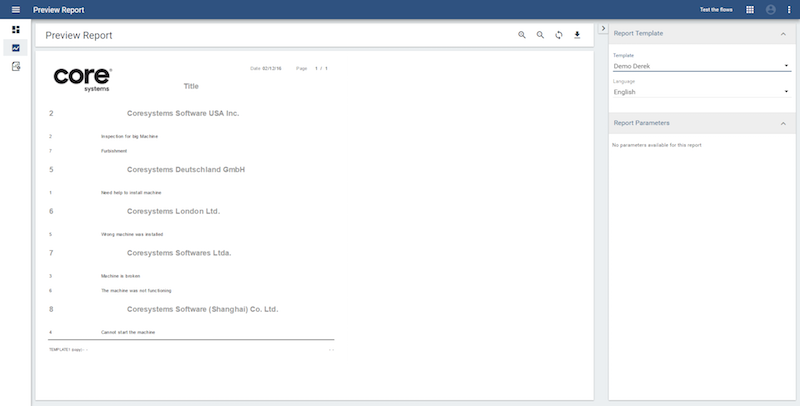 This will allow the client applications to generate input fields so the user can select a business partner for the report. If no parameters exist for the report, the report will be available as a “Menu Report”. Otherwise, the report will be stored on the data object (example: Business Partner, Activity, etc.). Select the project you want to upload. Select the company database to which you would like to upload the report. 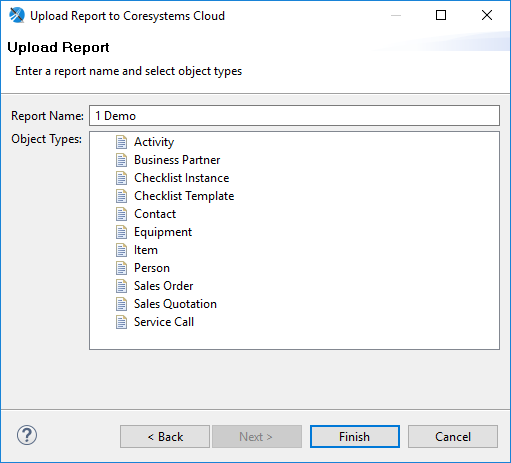 Select Project > Upload the Report to Coresystems Cloud from Eclipse menu. Choose the name under which your report will be visible. Keep in mind that the name has to be unique. 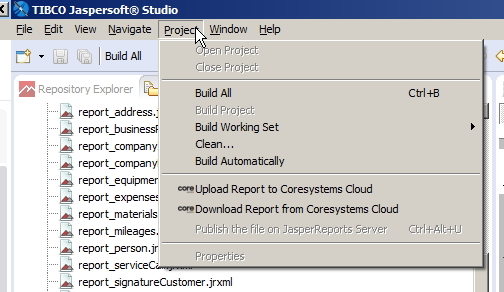 Select Project > Download the Report from Coresystems Cloud from Eclipse menu. Select the project you want to download. You can build your report by going to the Analytics & Reporting app and signing in with your coresystems account credentials. 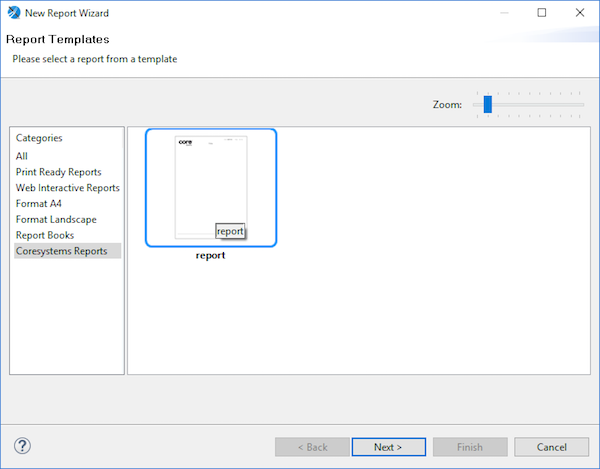 After selecting the report you created from the Templates dropdown menu, select the generate button to display the report. Note: Preview reports can be downloaded in excel, word, and PDF format. You can find more information on Coresystems Reporting in the User Guide.